Hands up if you’re guilty of leaving your foundation brushes a few weeks before cleaning them??! Tut tut…. 😉 we’ve all done it but it’s just not worth it in the long run and using a dirty brush can cause continuous spot breakouts as well as the fact that your foundation will not apply the same way if the brush is not clean. Because a lot of foundations are oil based, the product can really stay in your synthetic foundation brush, making it hard to remove no matter how much you wash it. 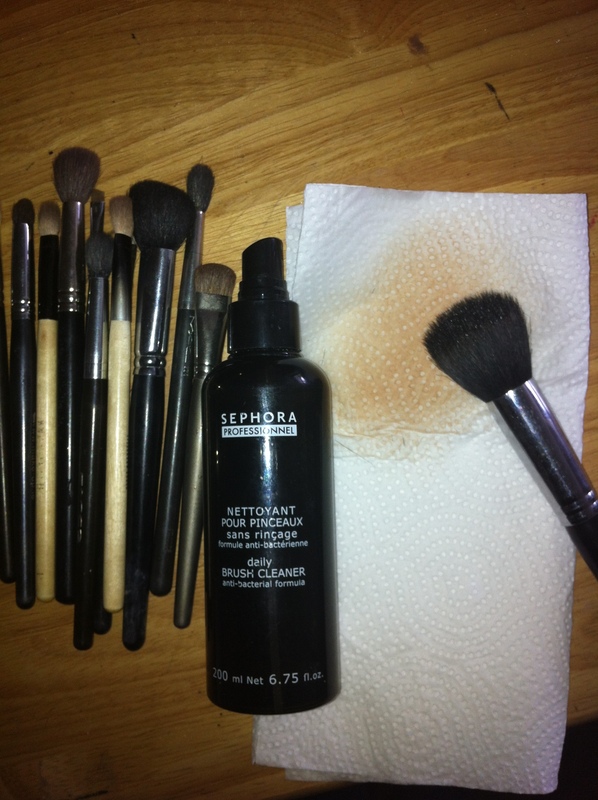 A top Makeup Artist’s tip is to get some olive oil and pour a couple of drops on a some folded sheets of kitchen towel and work the bristles of your brush gently into it to loosen the product, you should see a lot of foundation on the paper towel! You should then wash with lukewarm water and Fairy Liquid to really clean off all residue. 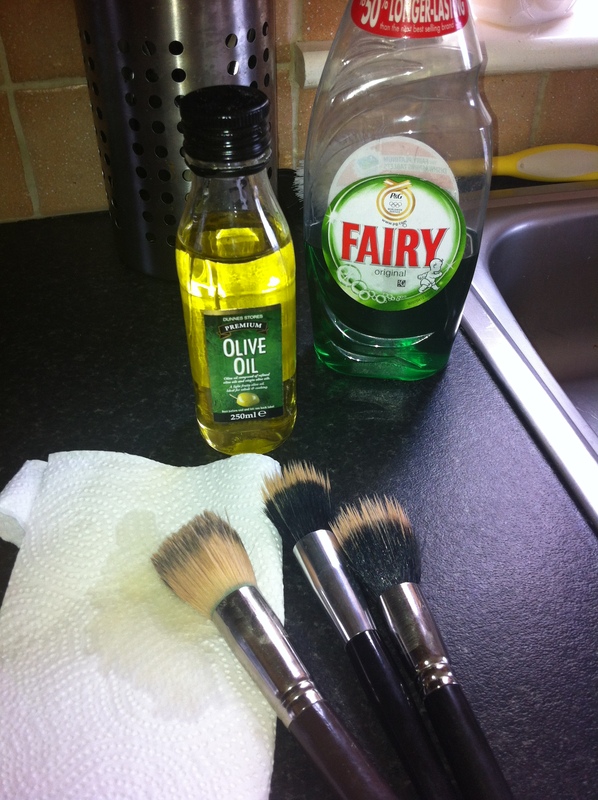 Fairy liquid is great to use on foundation brushes. It cuts right through the grease and removes all oil and other residue, and if you can use an anti-bacterial one, even better. When I’m washing my brushes, what I do is, squirt a small amount into the palm of my hand and gently swirl the brush into my palm working up a lather. Then I rinse thoroughly in the water taking care to only wet the brisles and not the wooden part of the handle as this will loosen the glue holding your brush together and make it fall apart, not a good idea if you’ve forked out for a good MAC brush! When you’re done, dry the brush off on a tea towel before reshaping and laying your brushes flat off the edge of a window sill to dry overnight. I am meticulous when it comes to washing my brushes after every makeup job I do, just to ensure they are always clean. The skin can harbour some nasty bacteria and it’s not something you want to be contaminating other people with! I also spray with a gentle disinfectant especially for brushes which makes them smell gorgeous 🙂 As for my personal brushes I wash my foundation and other brushes once a week and spot clean with anti-bac spray if they just need a light going over or to remove light eyeshadow residue. MAC do a great brush cleaner that dries instantly or some of the spray ones you get at beauty supply shops are good too. Non synthetic brushes (for eyeshadows etc.) should be washed gently with baby shampoo – they are real animal hair after all! 🙂 Look after your brushes and you’ll notice a big difference in your makeup applications – you simply can’t apply good makeup if your brushes are dirty! If you follow the steps above, your makeup brushes will last you a lifetime!